FASTING GIRLS. I. ABSTINENCE IN THE MIDDLE AGES. Among the many remarkable manifestations by which hysteria exhibits itself, for the astonishment of the credulous and uneducated portion of the public, and—alas, that it should have to be said,—for the delectation of an occasional weak-minded and ignorant physician, the assumption of the ability to live without food may be assigned a prominent place. I am not aware that this power has been claimed in its fullest development for the male of the human species. When he is deprived of food he dies in a few days, more or less, according to his physical condition as regards adipose tissue and strength of constitution; but if a weak emaciated girl asserts that she is able to exist for years without eating, there are at once certificates and letters from clergymen, professors, and even physicians, in support of the truth of her story. The element of impossibility goes for nothing against the bare word of such a woman, and her statements are accepted with a degree of confidence which is lamentable to witness in this era of the world's progress. 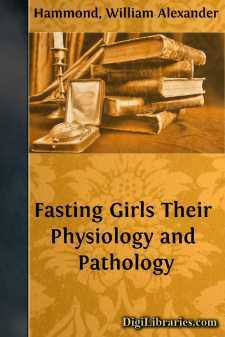 The class of deceptions occasionally induced by hysteria, and embracing these "fasting girls," has been known for many years, though it is only in comparatively recent times that the instances have been taken at their proper value. Görres gives a number of examples occurring among male and female saints and other holy persons, in which partial or total abstinence from food was said to have existed for long periods. Thus Liduine of Schiedam fell ill in 1395, and remained in that state till her death, thirty-three years subsequently. During the first nineteen years she ate every day nothing but a little piece of apple the size of a holy wafer, and drank a little water and a swallow of beer, or sometimes a little sweet milk. Subsequently, being unable to digest beer and milk, she restricted herself to a little wine and water, and still later she was obliged to confine herself to water alone, which served her both as food and drink. But after nineteen years she took nothing whatever, according to her own statement made to some friars in 1422, she averring that for eight years nothing in the way of nourishment had passed her lips, and that for twenty years she had seen neither the sun nor the moon, nor had touched the earth with her feet. Saint Joseph of Copertino remained for five years without eating bread, and ten years without drinking wine, contenting himself with dried fruits, which he mixed with various bitter herbs. The herb which he used for Fridays had such an atrocious taste, that one of the brethren, by simply putting his tongue to it, was seized with vomiting, and for several days thereafter everything he ate excited nausea. He fasted for forty days seven times every year, and during these periods ate nothing at all except on Sundays and Thursdays.